We are quickly approaching the “lazy, hazy crazy days of summer.” Your outdoor thermometer will regularly peak past the scorching 80-degree mark. On “nice” days, the air will become muggy and thick. Several days a week, thunderstorms will abound. Should I supply more excuses to stay inside and become a June through September couch potato? Even your dog recognizes the discomfort of “Hotlanta” summers. Your pet will naturally become more sedentary as the temperature rises and will likely wish to reduce his/her time outdoors. A pre-season health checkup from your vet. Before undertaking a rigorous exercise program, ensure that your dog is healthy. Overweight dogs may be limited initially in their exercise ability and endurance. Dogs with orthopedic problems may be limited in the type and intensity of exercise they can perform. Your veterinarian can provide you guidance regarding limitations pertinent to your dog. Dogs have a marvelous internal clocking mechanism and will do best when exercised at approximately the same time each day. In today’s lifestyle we do not have an abundance of quantity time, so we need to best take advantage of quality time. High intensity exercise, such as running, bicycling, roller blading, retrieving, or swimming, provides physical benefits faster than will a long walk. 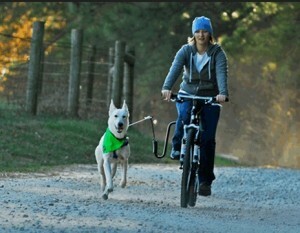 The Springer is an attachment that allows you to cycle your dog safely. Bicycling early in the morning, especially on a soft surface, is an excellent high-intensity exercise. However, do not provide an exercise mode or duration that is too intense for your dog’s age or health or that will subject your dog to the possibility of heat exhaustion or heat stroke. Select an exercise mode your dog will enjoy. Your schedule and geographic limitations. If the exercise is inconvenient it won’t remain regular. Pick an activity or a menu of activities that you can do on a daily or almost daily basis. With a small breed dog less than nine months of age, a medium or large breed dog less than one year of age, or a giant breed less than 18 months of age, limit the intensity of exercise and limit exercise to soft surfaces (turf, woods), as epiphyseal plates (growth plates) on long bones have not completely formed. Similarly, senior dogs may have orthopedic conditions or other health problems that require an exercise program of diminished intensity or duration. To avoid heat exhaustion or heat stroke exercise early or late in the day. To reduce the probability of stomach torsion/bloat, an often fatal condition, do not exercise your dog until two hours after feeding and do not feed your dog until one hour after exercise. Concrete can scour pads. Asphalt can burn pads, especially during the midday sun. Moreover, hard surfaces can create chronic joint injuries and pain. Therefore, we prefer exercise on natural surfaces, such as grass, mulch, or trails. Now that you know what to do, let’s get moving! CPT’s goal is to increase the number of healthy, happy, well-behaved dogs, as well as the number of healthy, happy dog owners. If you desire professional assistance in designing your dog’s exercise program, please contact CPT either by phone (404-236-2150) or by email via the Contact link at the top right of this web page. CPT’s elite professionals have trained the pets of over 50,000 Atlanta families. We would love to add you and your dog to our list of satisfied clients. © Copyright Mark Spivak and Comprehensive Pet Therapy, Inc., June 2006, Revised March 2014. All rights reserved.